As the year is closing, it is time for a summary of the observations conducted in 2011. In the second diagram above, it can clearly be seen that the spring and late summer were very good (many clear nights), while winter, and especially December, were very poor. New lenses - new lenses added to the repertoire were the very fine SamYang f1.4/85mm and a Canon EF 2.0/35 mm. The SamYang allowed to target fainter objects in LEO and MEO, going clearly deeper than the EF 2.5/50 mm normally used on brighter objects in LEO. It's FOV is still large enough to capture full trails. The Canon EF 2.0/35 was added to target fast moving objects in LEO such as objects near decay, Soyuz and Progress, and Keyholes in perigee passes. It has a similar aperture as the 50mm lens but a wider FOV. Video - Video finally did it's entry at SatTrakCam Leiden in late 2011. The equipment consists of a sensitive WATEC 902H camera that can be equiped with a number of lenses (including the above mentioned Canon EF 2.0/35 and the SamYang 1.4/85). A GPSboxSprite2 time inserter from BlackBoxCamera in the UK is used for the imprint of accurate time signals, and the video feed is recorded on a HDD recorder. Remote telescope - I have used remote rentable telescopes for some time for my work on asteroids. Starting mid-2011, I am also using them on satellites. The telescopes used are part of the SSON network and consist of a 37-cm and 61-cm Cassegrain located in California and Arizona. These received COSPAR station codes 8231 (Winer obs, MPC code 597) and 8438 (Sierra Stars obs, MPC code G68). I use them to target geostationary satellites visible from the western part of the USA. 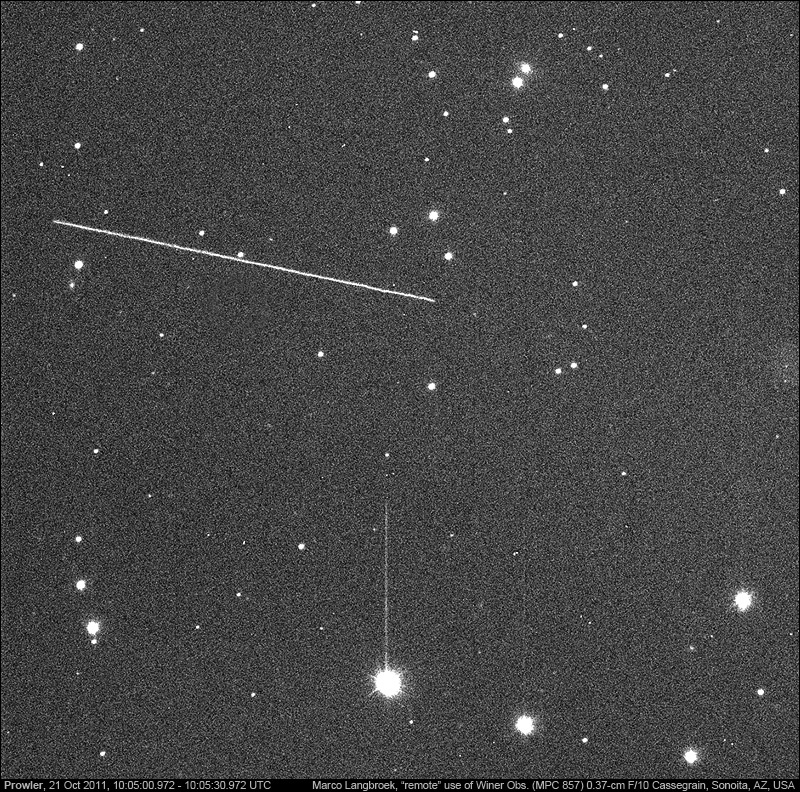 Two notable targets repeatedly imaged were the new SBIRS Geo 1 (11-019A) and the enigmatic Prowler (90-097E). Nanosail-D - This experimental NASA solar sail put on a fine show during late spring and summer. A study was made of the brightness variation of this object. See various posts here. The last Space Shuttle missions - The truely last one was not observed, but the last flight of Discovery was imaged several times. Spectacular IGS 1B flare - IGS 1B is a Japanese spy satellite that failed in 2007, will reenter in 2012-2013 and probably still has some fuel onboard. When I posted on the latter on this blog, this generated some interest, even from the White House. On September 2nd, I observed a brilliant flare produced by this satellite, one of the best satellite flares I have ever seen. 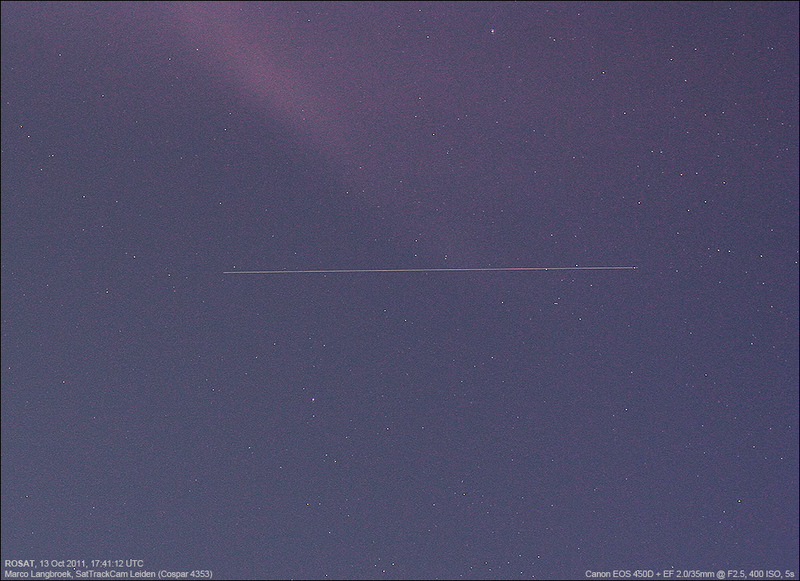 UARS and ROSAT - the uncontrolled reentries of these two satellites generated a lot of attention. 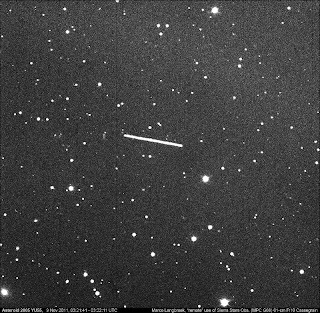 ROSAT was actually observed twice by me shortly before its reentry, see here and here. Fobos-Grunt - This Russian probe launched in November should have gone to Mars and the Martian moon Phobos for a sample return mission. A rocket engine failure however got it stuck in Low Earth Orbit, from which it will reenter mid-January. I observed, photographed and even filmed it a number of times. Andre Kuipers to the ISS - on December 21st, a Soyuz with Dutch astronaut Andre Kuipers was launched for a six-month mission to the ISS. 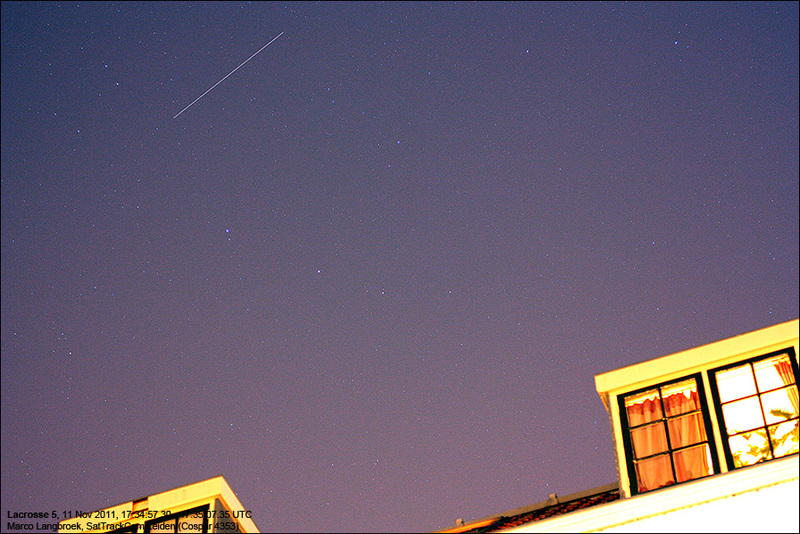 Just before the end of the year, I finally could see the ISS with Kuipers on board pass over Leiden and film it (between launch on December 21 and the sighting on December 30th, it had been very bad weather). Andre's Soyuz 3rd stage decay - Due to untimely cloud cover I did not observe this event myself, but was involved in the identification of it. The spectacular decay in the evening of December 24th was seen by many people in the east, central and southern parts of the Netherlands (where it was clear, unlike in Leiden), as well as from Germany and France. 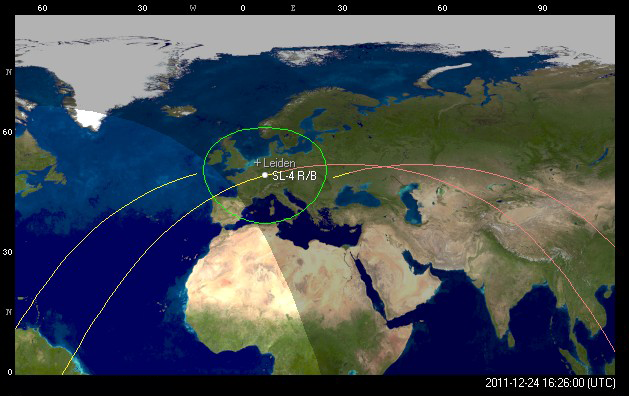 Ralf Vandeberg (B), Josep Remis (F) and me (NL) independantly were the first to identify the slow fragmenting fireball with the Soyuz 3rd stage used in the December 21 lauch to the ISS, disseminating our identifications on mailing lists, twitter and blogs within half an hour after the fireball apparition. Read more here. 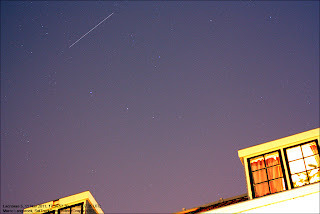 The footage above was shot by me this evening (30 December 2011, evening twilight, around 16:38 UTC = 17:38 local time). 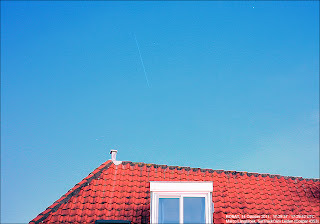 It shows the International Space Station (ISS) with Dutch astronaut Andre Kuipers on board, passing right over my observatory in Leiden, the Netherlands. The movie was shot using a sensitive WATEC 902H camera and F1.4/12mm lens (this is not the best of lenses in terms of sharpness, but it has a relatively wide FOV of 30 degrees that suited this case. This lens provides a reasonably good approximation of the typical visual view as well in that the limiting magnitude of the movie is similar to that with the naked eye). I had actually almost missed this pass, as I was busy with another task and lost track of time. So I had to set up my equipment rather in a hurry, with no time to start up and synchronize the GPS time inserter. As usual (and also because I do not yet ahve a "routine"with this new equipment) I initially had an "issue" in getting an image on the laptop monitor: when I finally had an image and could focus, the ISS was already in the sky, ascending at 45 degrees elevation in the west.The sky was still a bit bright from twilight, and some hazy clouds were in the sky. 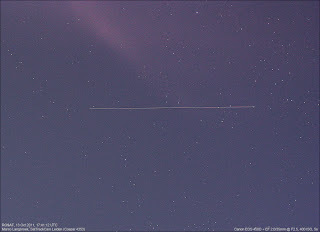 The footage picks up the ISS in northern Cygnus, shows the ISS as it ascends and goes through the zenith, passing over Pegasus and into Andromeda and next descends through the triangle towards the east, disappearing behind the roof of the house. I am happy to have this footage at all, as the weather is abominably bad this month. I earlier wrote about the confusion reigning in the press concerning the sky event over Europe of last Saturday evening. Initial confusion was over wether it was a meteor, "comet" or (and that was the correct explanation, but many Dutch and German news outlets failed to properly pick that up): the reentry of a Soyuz rocket. Now a new confusion has arrisen: some news outlets and weblogs, e.g. that of Physorg, mistakenly link the event to last Friday's failed Russian launch of the Meridian satellite. Due to a rocket failure, this never reached earth orbit but crashed in Siberia within minutes after the launch. 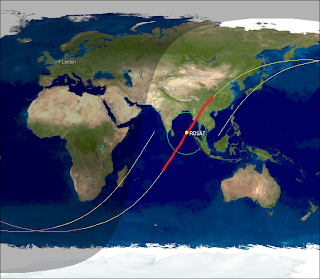 As I wrote earlier, what reentered and was seen over France, Germany and the Netherlands last Saturday evening, was the 3rd stage of last Wednesday's Soyuz launch to the ISS. The confusion probably comes from the fact that both launches used a Soyuz rocket. The failed launch that crashed in Siberia on Friday got some press attention because fragments hit a house in Russia (see a.o. here (English), with pictures of a recovered fuel tank here (Russian)). But again: that failed launch had nothing to do with Saturdays sky event over Europe. The reentry over Europe was the 3rd stage of the earlier Wednesday launch to the ISS, that included Dutch astronaut Andre Kuipers. In the wake of the spectacular reentry over NW Europe of the Soyuz 3rd stage 2011-078B on Saturday 24 December 2011, several common questions popped up in comments, e-mails, on Twitter and in newspaper discussions. I will answer a few below. (Q1): Are these things predictable and who makes such predictions? (Q2) Does it really take a Soyuz rocket 3rd stage three days to fall back to earth? (Q3) Why doesn't this happen with each Soyuz launch? Or: why not over the same location on Earth? (Q4) has anything of the rocket stage survived to earth surface? (A): It is "sort of" predictable. Using computer models which take into account many factors of influence, one can make a prediction yielding an indication of the time a rocket stage or satellite will re-enter the atmosphere. However, even very close to that actual time of reentry, the uncertainty in these predictions is still very large. Exactly when a rocket stage will start to burn up depends on many factors, including the exact condition of the atmosphere at that moment, the shape of the rocket stage, and whether it is tumbling or not. In practise, this turns out to be very difficult to model, even with the best computer models. Several organisations and individuals do such predictions (and you can even find software for it on the internet). However, one of the most authoritive sources of such predictions is USSTRATCOM, the American military organisation that tracks manmade objects in space (many people think NASA does that job. But that is incorrect: it is USSTRATCOM, better known as 'NORAD'). They publish these predictions as 'TIP' messages. Their first prediction is published 2 months in advance. These still have a very large uncertainty (think of: weeks). In the days close to decay, they publish new estimates as new TIP messages that gradually become more exact. But even these can have uncertainties of several hours, even for predictions made on the day of the reentry itself. Once an object has reentered, USSTRATCOM does a post-analysis of the last orbital information, and publishes a "final' TIP message mentioning when and where the object came down (so this is done "after the fact"). These can be (but are not always, as it depends on how well the object was tracked during it's last hours of existence) very accurate. Sometimes, as was the case with this reentry of the Soyuz 3rd stage, they provide a time with an uncertainty of only minutes, plus a quite accurate position. In other cases, where less recent tracking data is available, the final uncertainty is much larger. Note that a re-entering satellite or rocket booster has a speed of 7.5 km per second (4.7 miles per second)! So even if the predicted time has an uncertainty of just 15 minutes, this amounts to an uncertainty of 13,500 km (8,400 miles) in the position of the object when it reenters! This is why it is impossible to pinpoint the expected point of re-entry beforehand, when it is not a "controlled" re-entry. (in a "controlled" re-entry, the satellite operators send a command to the satellite to make a rocket burn at a precise time, kicking it down over a designated spot, usually the Pacific ocean. This Soyuz reentry was however not such a "controlled" reentry). Many people mistakenly think that in this day and age of supercomputers, scientists (or the military) can predict everything. In reality, satellite/rocket reentries like this are so complex that even the best computer models can only give rough indications untill just minutes before the actual re-entry. (A) Yes, it does. That last rocket stage is jettisoned that high above earth surface, that it does not just rapidly fall back on a ballistic trajectory (such as the 1st and 2nd stages do) but actually reaches Low Earth Orbit, and stays in orbit around the earth for several days. In effect, it becomes a satellite for a while in a very low orbit around Earth. Under influence of gravity and drag from the outer atmosphere, the orbit slowly evolves and becomes smaller and smaller. On the first day only gradually, but as it slowly comes down, this gradually goes faster and faster. The influence of our atmosphere reaches several hundreds of kilometers up: even the International Space Station experiences some atmospheric drag, and would fall down within a year if its orbit was not regurlarly raised using the rocket engines of the Progress spacecraft docked to the ISS. It takes about 3-4 days for a Soyuz 3rd stage from a launch to the ISS to come down. The exact amount of time is variable and different in each new case, as it depends on many factors. Our atmosphere is variable in extent and density, notably under the influence of solar activity. When the sun is active and many charged particles from solar outbursts reach earth, these interact with our atmosphere and the atmosphere slightly expands as a result of this. This means that objects at the altitude of the Space Station and below that (such as the Soyuz rocket stage) will experience a "thicker atmosphere", i.e. more drag from the atmosphere's outermost layers, and as a result they will come down faster. When it reaches at altitude of only 120 km (75 miles) it goes very quick: within minutes the rocket stage has dropped tens of kilometers, slowed down considerably, and finaly plunges straight down from that moment onwards. The exact moment this happens, is highly dependant on these variations in extend of our atmosphere due to variations in solar activity. This is another reason why a satellite or rocket re-entry is so difficult to predict: one short but intense outburst occuring on the sun will next make a rocket stage fall back much quicker than expected. 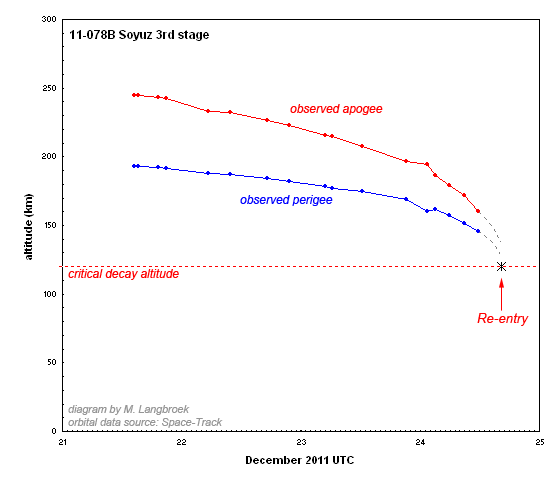 Below diagram shows the orbital evolution of the Soyuz 3rd rocket stage that decayed last Saturday. It had to make 52 full orbits (full circles) around the Earth before it burned up. It's orbit was a bit "eccentric", which means that it was not a perfect circle but an ellipse. So on each revolution around the earth, there is a point where it is a bit higher above earth (called the "apogee") and a point where it is closest to the earth (called "perigee"). In the diagram, the values for these altitudes have been plotted as a red and blue line. Note how fast these altitudes change in the final hours before re-entry. (A) It does happen with each Soyuz launch to the ISS. The Soyuz 3rd stage always comes down some 3-4 days after the launch. That reentry however is never over the same location on earth. The reasons for this, have already been outlined as part of the answer to question (2) above. An important factor of influence on how quickly a rocket stage comes down, is the variable earth's atmosphere, under influence of variability in solar activity. These factors are different for each new case. This is why the 3rd stages of Soyuz launches to the ISS never fall down near the same spot twice. (A) Not that we so far know of. Usually, the rocket stage almost completely burns up in the atmosphere. Sometimes, a few smaller bits survive (quite often spherical fuel tanks). For example, an object that is likely a rocket fuel tank came down in Namibia in November and might be part of a rocket stage used in a Russian November launch to the International Space Station. 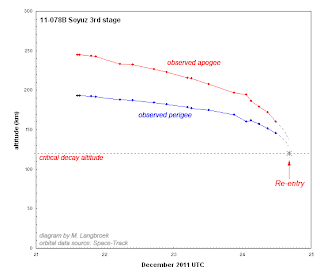 [Updated] Breaking News: Decay of Soyuz r/b stage from André Kuipers' launch to ISS observed from the Netherlands! 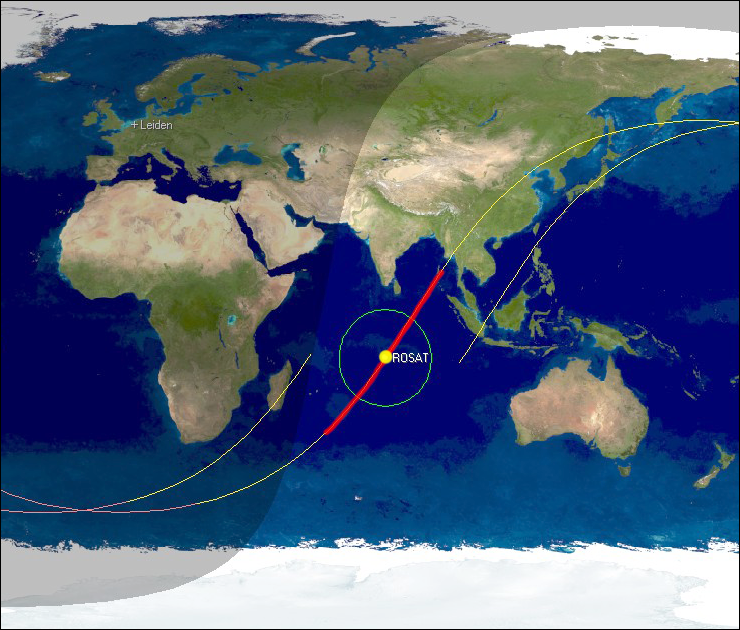 UPDATE - the final TIP for Soyuz r/b 38037 / 2011-078B has been released by USSTRATCOM near 18h GMT and it indeed shows that this was the Soyuz r/b: reentry time is quoted as 16:25 +/- 1 minute GMT at 49 deg N, 7 deg E. This fits the observations well. In the Dutch press, there meanwhile appears to be a lot of confusion. The Dutch National Police claims that they talked to "NASA" who apparently said it was a "meteor" (or "comet"). So THAT is widely claimed in the press now, to the point of calling the identification with the Soyuz 3rd stage "speculation". Which it is not: it is based on factual data and now clearly confirmed by the USSTRATCOM JSpOC TIP message. What more do you want?! At any rate: appart from my analysis below (which is already clear), the USSTRATCOM TIP message mentioned above makes unambiguously clear that this was the Soyuz 3rd stage. Note that to access the USSTRATCOM TIP message via the link above you need an approved account. USSTRATCOM is the US military Command responsible for tracking manmade objects in space, and perhaps better known under their former name NORAD. 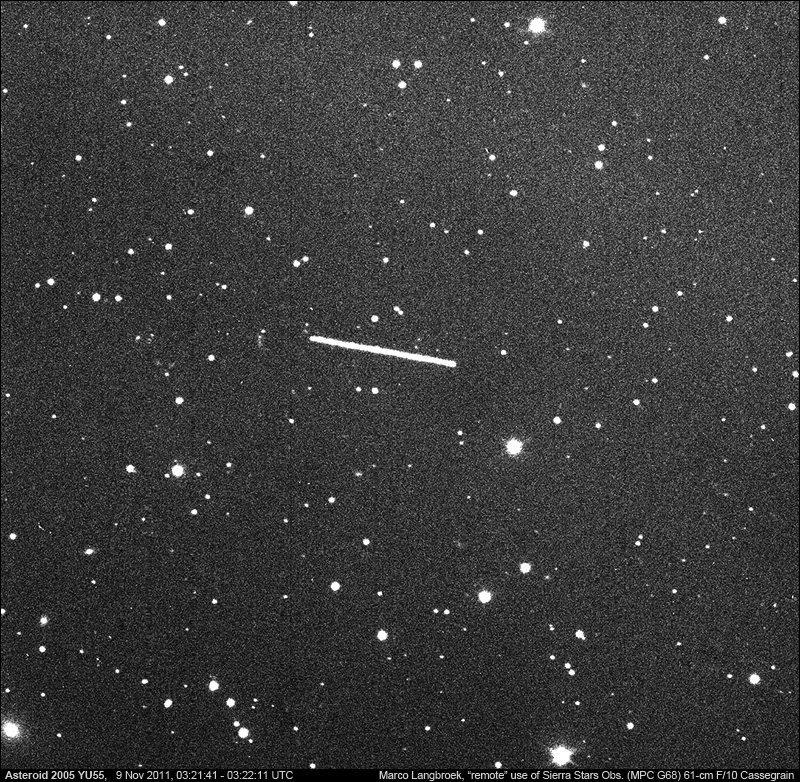 Multiple reports are coming in, among others by experienced Dutch meteor observers Carl Johannink (Gronau) and Arnold Tukkers (Denekamp), of a bright and very slow fragmenting object seen low in the west-southwest near Venus at 16:26 UTC, 24 December. From the descriptions it clearly was a reentry of an artificial object (space junk), as the event was too long in duration and too slow to be a meteoric fireball. The observations fit with 2011-078B (#38037), the last stage of the Soyuz rocket that brought Dutch astronaut Andre Kuipers up to the ISS earlier this week. It was already predicted to decay near this moment by USSTRATCOM. Below is the predicted trajectory of the Soyuz 3rd stage for the Gronau/Enschede area (and below that, the ground trajectory). 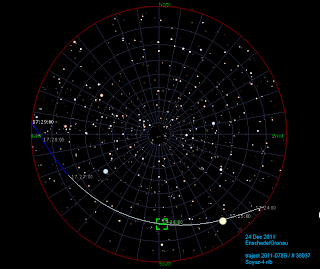 It is based on an orbit with an epoch near noon of 24 December (epoch 11358.49032868. Source: USSTRATCOM), so a few hours old, which will introduce some minor discrepancies (a few seconds in time). But it fits the descriptions very well in terms of time and trajectory in the sky. I recently modelled the re-entry of 2011-078B in GMAT, using the MSISE90 model atmosphere with actual Spaceweather of that time. Drag surface was set at 60% of the maximum drag surface for a Soyuz upper stage: this yields a decay position and decay time well in agreement with the JSpOC TIP position and is close to what the drag value for a tumbling, fragmenting object would be. 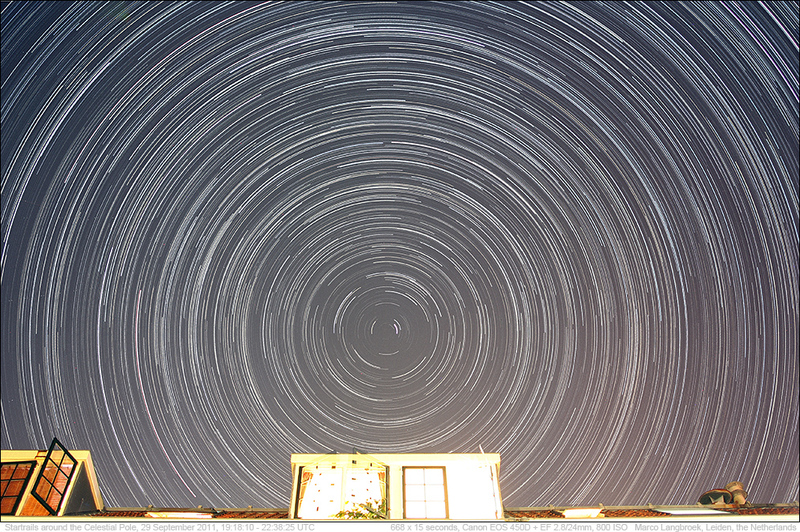 As seen from Gronau in Germany, it yields the following sky trajectory. Compare with Carl Johannink's description below: it matches his description well. At 17:26 CET (=16:26 UTC) I looked out of the window and saw a strange phenomena just above the rooftops behind us. It looked like a very, very slow meteor fragmented in several pieces. Like Peekskill but less bright. What a sight! Trajectory for me (did not see initial part) southwest-southeast. Altitude maximum 20 degrees. Colour brown-red. Just was looking at Venus in evening twilight. Left of it an object appeared from behind a cloud that I first thought to be an aircraft, but next I found something was not right. The thing sometimes brightened and became fuzzy, trailing a circa 8 degree long tail. Maximum brightness about -4. The object roughly moved from SSW to SE at an elevation of about 15 degrees. The whole phenomena took over half a minute. To see the second part of the trajectory I had to walk to a different room. Called in Elisabeth, together we saw the object fragment into pieces (each individual piece about mag. 0 to +1) and then fade out. The whole event looked much alike to the New Years Eve satellite decay of 1978, albeit being somewhat less bright. Read the answers to Frequently Asked Questions for this reentry case I published later here. It was clear this evening, and the Russian Mars/Phobos probe Fobos-Grunt (2011-065A) stranded in Low Earth Orbit made two visible passes which I both observed. The first pass was in deep twilight, 16:08 UT with the sun only 5 degrees below the horizon. The sky was still bright blue and only the brightest stars (Altair and brighter) were visible. Nevertheless, Fobos-Grunt was easily visible by the naked eye, becoming clearly brighter than Altair around and after culmination at 45 degrees elevation in the south. It was very fast and showed no sign of brightness variation. A very fine view! The lens used was the SamYang 1.4/85 mm and because of the low elevation and city environment, I kept the exposure short to 5 seconds. 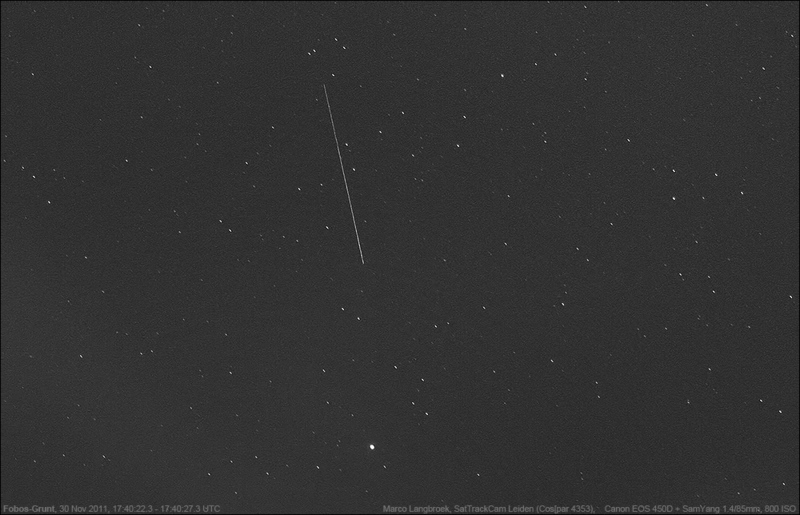 Due to a different phase angle compared to the earlier pass, the space-probe was faint, near +4. 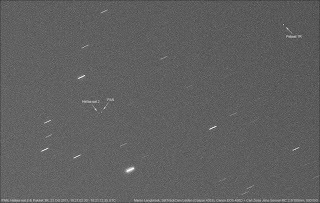 The footage above was shot by me this evening, and shows the Russian space probe Fobos-Grunt (aka Phobos-Grunt or Phobos-Soil), 2011-065A. Fobos-Grunt was supposed to go to the Martian moon Phobos for a sample return mission. Instead it got stuck in a Low Earth Orbit, due to a rocket engine malfunction. It is now expected to re-enter into the earth atmosphere early to mid January. This footage was shot from my girlfriend's appartment at the second floor of our appartment building: only there was I able to point low enough in the sky. The footage shows the space-probe at an elevation of less than 15 degrees over the western horizon. It enters earth shadow at the end of the 50 second clip. Above is the video footage that was shot by me. 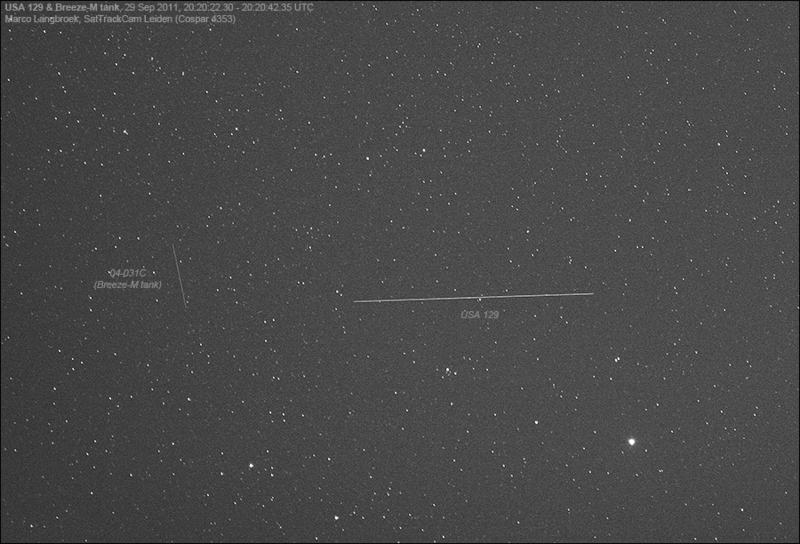 What turns out to be the A-component can be seen crossing Lyra (bright star is Vega. The glow in the lower left corner is from a nearby lamp), but no C component is to be seen in this video segment (nor was it for one minute before and 3 minutes after this segment). Next, Derek Breit missed it as well in a window of 8 minutes centered on the A object pass, and so did Brad Young. Over the past few days, two possible obervations have been made of the missing C-object, now well away from the A object, by Brad Young and Bill Arnold. The break-up of the NOSS 3-1 pair probably means it had reached end of mission. It is interesting to see that some of the older NOSS pairs (and one trio) do still maintain their pair bonding though..
Another satellite, the 14 year old SAR satellite Lacrosse 3 (1997-064A) has gone missing in a more serious way. It has not been seen since early October. Several observers including me and Pierre Neirinck have done plane searches but so far, it hasn't been recovered. So it has either manoeuvered into a completely different orbit, or has been de-orbitted. If the latter is true, this possible de-orbit comes half a year after the de-orbit of Lacrosse 2 late March 2011. It leaves two remaining Lacrosses in orbit (Lacrosse 4 and 5). Note: the video below was featured (with my permission) on Spaceweather.com. Unfortunately, it was initially suggested there (and this definitely did not come from me) that the discussed "disappearance trick" is a deliberate "stealth" feature of this satellite. It almost certainly is not: it is something brough about by accident from something specific in the satellite design. I also want to make clear, as it kept popping up in the YouTube comments (which I have now disabled), that this is not the moment the satellite disappears in earth shadow! The drop in magnitude happened at 17:35:20 UTC: shadow entry was much later, 17:38:55 UTC. The video above was shot by me Friday evening (11 Nov). It shows Lacrosse 5 (2005-016A), the latest of the Lacrosse SAR satellites. It was launched in 2005. In the movie, it is doing it's infamous "disappearance trick" (also note the old Russian rocket stage visible in the second part of the footage). The brightness behaviour of this satellite is different from that of the previous Lacrosse satellites. Apart from that it is brighter overall and a bit yellowish in colour (the others are distinctly orange-reddish), it shows a variable brightness behaviour that the other Lacrosse satellites do not show (or at least not to this extreme extend). Lacrosse 5 can sometimes drop several magnitudes in brightness, typically from +1 (easy naked eye) to +5 or +6 (naked eye invisibility or near-invisibility), in a matter of seconds. After observing this a couple of times, I coined it the "disappearance trick", a term that has stuck in the amateur satellite observer's community. While many satellites can flare briefly (and the Lacrosses do), this opposite effect of one suddenly dropping in brightness other than due to normal phase angle changes or entry into earth shadow (which is not the case here!!! ), is not quite common. And Lacrosse 5 does it that frequently, that it stands out. b) the satellite is tumbling. Both are not the case here. These "disappearance tricks" of Lacrosse 5 happen well before the point of shadow entry. In addition, the behaviour is not the typical "flashing" behaviour of a tumbling or spinning satellite. There is no periodicity, and the drop in brightness happens after a long period of stable brightness. The behaviour is interesting, because the sister ships of Lacrosse 5 (the other Lacrosses) do not typically show this behaviour. The implication is, that Lacrosse 5 is different in design than Lacrosses 1 to 4. I have photographically documented the phenomena several times, including brightness curves (see here, and a comparison of several curves showing the phenomena here, featuring the comparative diagram shown below). 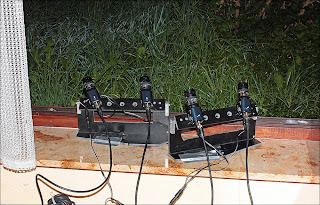 Philip Masding has been documenting the phenomena as well, his results can be seen here. His curves also show, and I have seen this happen as well, that Lacrosse 5 can sometimes "re-appear" (and, as I have seen occasionally, next "disappear" again...). One point is, that we so far cannot find a clear pattern in this all. The satellite does not seem to do this at specific phase angles for example. We are still at a loss to explain this behaviour. Please note: we don't think it is an intentional "stealth" characteristic. Yet it must have something to do with the satellite design or operation. Is it a matter of strongly differing reflectance properties of the satellite body with illumination angle? Is it some brightly reflecting appendage on the satellite disappearing from view? Is it a dark appendage on the satellite starting to block view of the illuminated satellite body, or casting a shadow on it? Is it due to some moving part of the satellite, e.g. a moving dish antenna? We simply do not know. And it is giving us a nice puzzle. The photograph below, taken in addition to the video footage above, shows Lacrosse 5 in the bright phase of Friday's trajectory. As new attempts to contact the probe failed, the future is looking increasingly grim for Fobos-Grunt (aka "Phobos-Grunt" and "Phobos-SOIL"), the Russian space probe launched on 8 November that should have gone to the Martian moon Phobos for a sample return mission, but instead got stuck in Low Earth Orbit. If the probe isn't revived in due time - and the Russsian operators are still frantically trying to do so - it is doomed. With an orbit at this low an altitude, it is a short matter of time before it comes down again - another case of an imminent uncontrolled reentry of a very large satellite (over 13 metric tons, including the fuel). How much fuel is onboard is not clear to me: different media sources quote quite different amounts, but all amounts quoted are in terms of several tons, with several sources settling for 7 tons (see also here). As pointed out here by Anatoly Zak, seizable chunks of the probe could survive reentry, and survival is certainly expected for the actual Fobos sample return capsule (which was designed for reentry). Estimates of when Fobos-Grunt will come down are a bit complicated. Ted Molczan has noted that over the past day, the orbital evolution was unusual - Ted points out that if the last two orbit releases are not faulty (a possibility), it means that either the probe is manoeuvering (which from all the negative statements by the Russians in the press seems unlikely) or - more likely - has started to vent fuel since yesterday. As a result, it might have gotten a very mild orbital boost (the leaking fuel acts like a small rocket engine). Before this unusual behaviour started, orbital elements 11314.14749491 to 11314.77184893 and Alan Pickup's SatEvo software with current solar activity levels suggested a nominal reentry time no later than early January 2012. 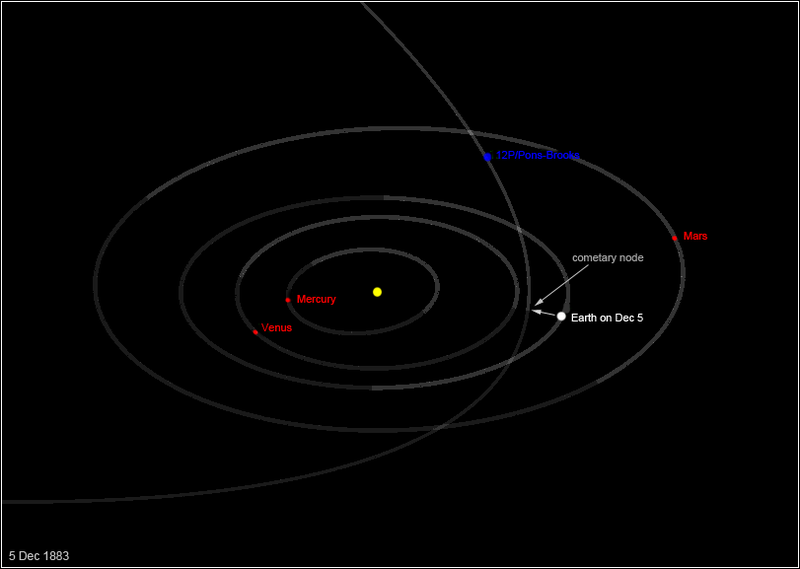 SSC meanwhile predicts reentry for November 26th, 2011. The current unusual orbital evolution - if real - might change things a bit, but eventually it will come down. This means it will likely come down somewhere over the next few weeks or months if the operators cannot revive it over the next two weeks. With an orbital inclination of 51.4 degrees, it can come down anywhere between 51 N and 51 S latitude. There has been a call out to observers to observe the probe - it's brightness behaviour can yield clues as to whether it is starting to tumble, e.g. because of the suspected fuel venting. So far, observations by Brad Young and Michael Murphy from the US suggest the probe is stable in brightness with no sign of tumbling (see here and here). Unfortunately, the probe is currently not visible from NW Europe where I am located: it makes passes near midnight, completely in shadow. For quite a while, I have had a wish to add video to my observing techniques. That moment is now there. During last October's Draconid meteor campaign, I was introduced to working with WATEC 902H camera's (see my previous post here), and discovered it was not that technically complicated after all. So when I saw one offered for a very good price in a clearance sale in October, I bought one. The WATEC 902H is a sensitive surveillance camera, which is able to film stars - and satellites- in the night sky. It is small (fits in the palm of a hand). I still need to add a GPS time inserter (it has been ordered already) for adding precision timing to the video frames. Once that is done, the system is complete. 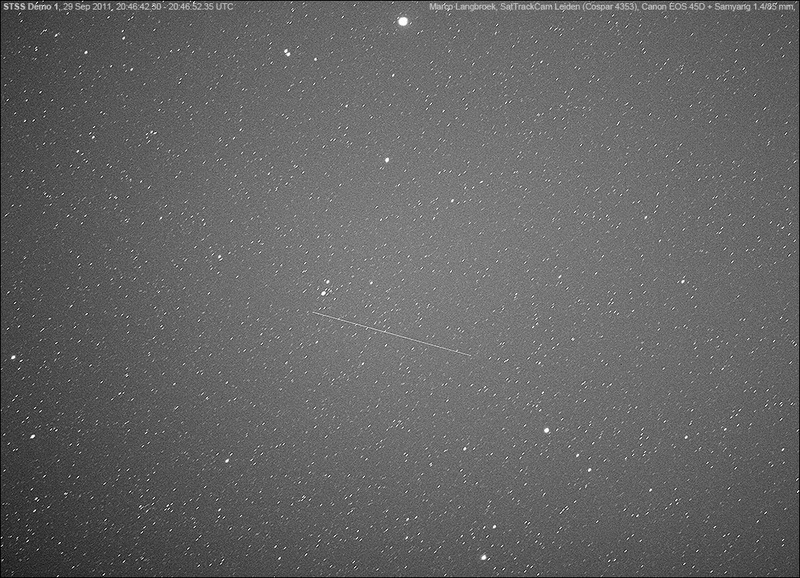 Meanwhile, I did some test imaging when it briefly cleared last Wednesday evening. Conditions were not optimal: moonlight and a bit of haze. Below are two results, both movies made using a Canon EF 2.0/35mm lens attached to the camera and in both cases the opening shot shows the "dipper" of Ursa minor, with the brightest stars being beta and gamma Umi. The first experiments were a bit more problematic than anticipated. Initially, I tried to feed the video signal from the camera directly into the laptop (and record using the laptop) using an EasyCap capturing device. That turned out to not work that well. My laptop is old and apparently too slow, and too many frames were dropped resulting in movies that did not flow well. On the advice of Scott Campbell, Kevin Fetter and Greg Roberts, I then added a HDD recorder to the equipment, recording with this device rather than with the laptop. That turns out to work fine, and resulted in the footage above (note: the original movie files are a bit better in quality than these YouTube versions). I do not intend for video to replace photography at my observatory: I intend it as an augmentation to the photography. Every once in a while, it is nice to have actual moving footage. Both techniques have their pro's and con's. Video has accurate timing but low astrometric accuracy (due to the low resolution of the imagery). 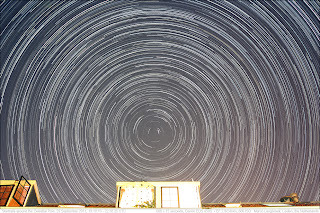 Photography has a high astrometric accuracy, but less timing accuracy (although by now, after much practise my time residuals are usually well below 0.1s). I think the pro's and con's of both techniques largely even out. One pro point of photography, is that it doesn't need a power supply - meaning you can be more mobile. Apart from using it on satellites, I also intend to employ the WATEC for meteor surveillance (Peter Jenniskens' CAMS system, if I can get the software to work here, which so far turned out to be problematic) and for observing asteroid occultations. 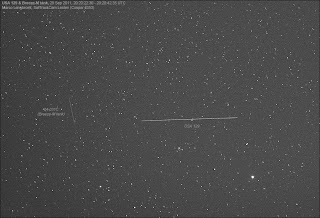 Half a year after the close approach of asteroid 2011 MD (see my images here and here), another one whizzed by the Earth last night. 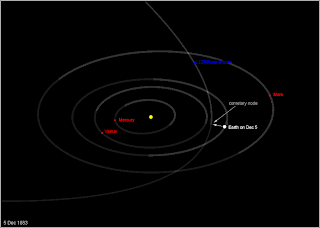 It was 2005 YU55, a 400-meter wide asteroid discovered in 2005 by Spacewatch. 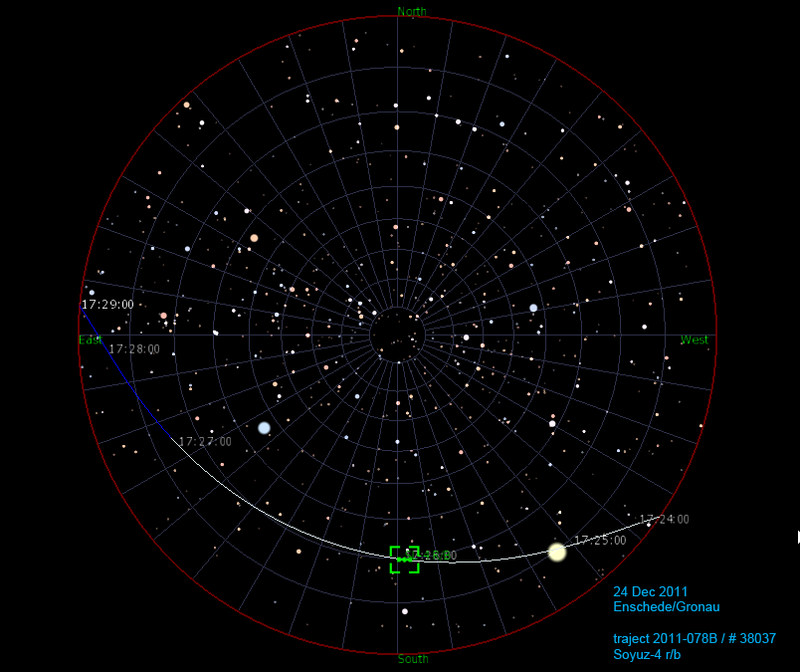 It came to within 0.85 lunar distances at 23:28 UT (Nov 8, 2011), with a maximum brightness near +11. 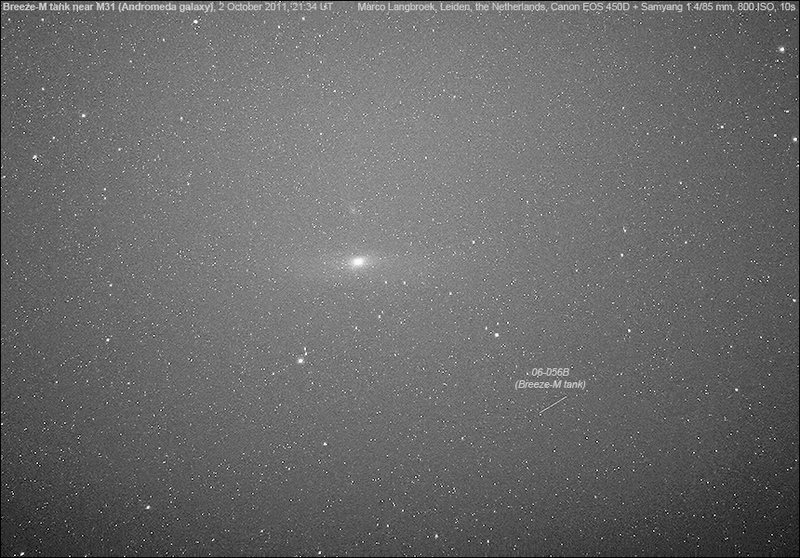 Four hours after closest approach, I made the image above, using a "remote" 61-cm F/10 Cassegrain telescope at Sierra Stars Observatory (MPC G68). 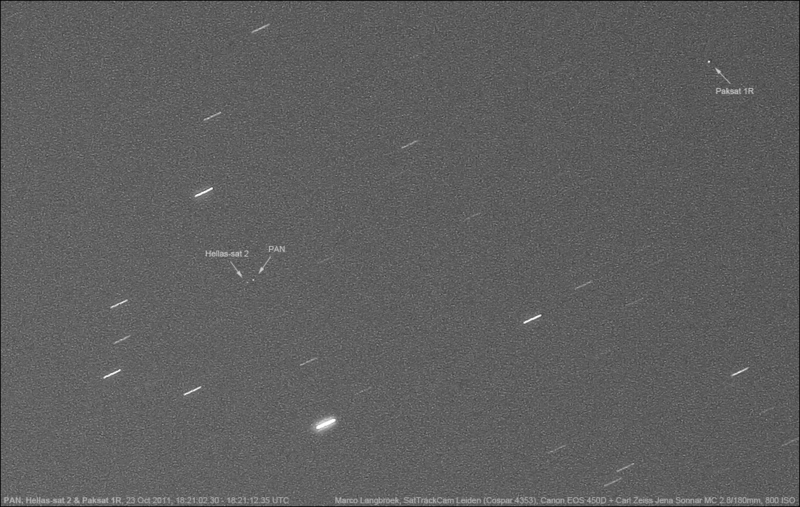 It is a 30 second exposure starting at 03:21:41 UT (9 Nov 2011), during which the asteroid (moving from right to left) has trailed considerably. 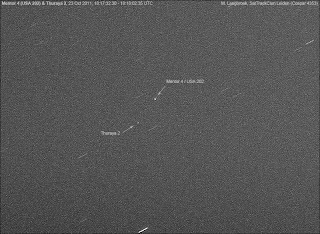 While the focus was on LEO and HEO satellites earlier in October, I primarily targetted Geostationary satellites last week. 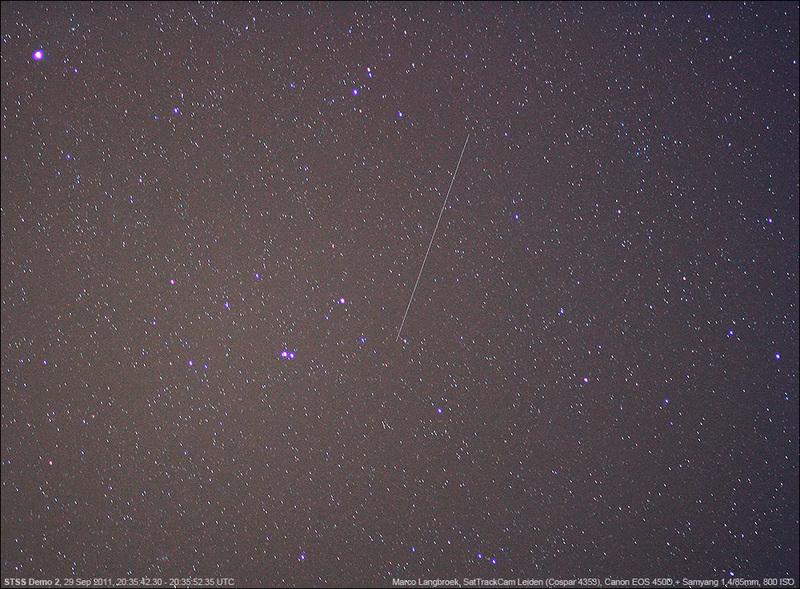 Both from my own locality with my own equipment, as well as by means of a "remote" telescope in Arizona. The two images below were taken from Leiden (the Netherlands) in the early evening of October 23, using my own equipment (Canon EOS 450D + Carl Zeiss Jena Sonnar MC 2.8/180mm). They show the enigmatic, frequently re-locating PAN satellite (09-047A: see Dwayne Day's article here) and the SIGINT (eavesdropping) Mentor 4 (USA 202) satellite (09-001A), as well as a few commercial geostationary telecom objects: Hellas-sat 2 (03-020A), Thuraya 2 (03-026A) and Paksat 1R (11-042A). As can be seen, PAN and Hellas-sat 2 are a very close pair now, so close that I am not actually 100% sure which one is which (the westernmost one or rightmost one is likely PAN). As can be seen in comparison to this post from May, it has relocated again, from 45.0 to 38.9 E - it did so in July, when I was on hollidays. Somewhat earlier the same week, when the sky in Leiden was overcast, I took refuge by hiring a "remote" telescope again. This time not the 61-cm of SSON, but the 37-cm Cassegrain of Winer Observatory (MPC 857) in Sonoita, Arizona, USA. While a smaller instrument, this telescope has a larger FOV which is good if the satellite is a bit off from predictions, and allows te satellite to be captured on more than one image when a 3-image run is done. Also, it is cheaper to rent. 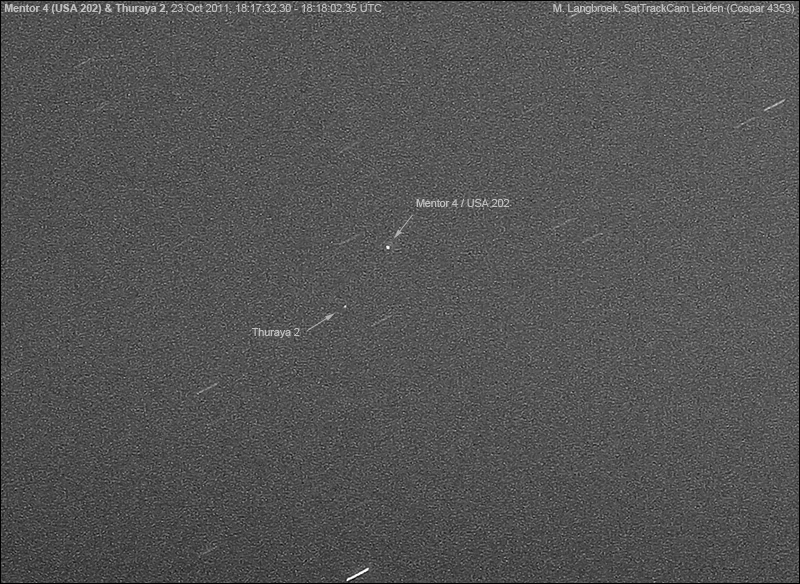 Note: because the telescope follows the stars, the satellites become trailed, unlike the images shot from Leiden which are from a stationary tripod (hence the stars trail, but the satellites not). A few non-geostationary satellites were tracked the past two weeks as well. They include the STSS Demo 1 & 2 (09-052 A & B) and the USA 89 r/b (92-086C) on October 22, and the HEO ELINT & SBIRS platform USA 184 (06-027A) on October 15. ROSAT is no more.....according to a TIP bulletin by SSC issued at 03:41 UTC, it reentered at 1:50 UTC +/- 7 minutes, placing it over the Indian Ocean (and far away from any eyewitnesses, bar maybe some ships and maybe Ceylon, Sumatra and Birma/Malaysia/S-China if it survived into the second half of the given window: and of course the US tracking facility at Diego Garcia). - The first is with the last available TLE (issued over a day before the reentry) propagated with SatEvo. Update to my previous post: Space-Track (SSC) finally released a new elset, 11294.85810509, which is still and "old" elset (almost a day old). And they released a new TIP with a new reentry prediction. Other independant analysts have not updated yet (see my previous post for these values). I did a run of SatEvo with the newly released TLE and the current F10.7 cm solar flux, and get, for what it's worth, a projected time of 10:20 UTC (23 Oct) +/- 5 hrs. That seems a bit late compared to the SSC and Zimmer estimates (although the uncertainty windows of course overlap). New independent updates on the projected moment of the ROSAT reentry are hampered by the fact that no new orbital elements have been released for 1.5 days now - the last elset released being elset 11294.06213865 (epoch time 21 Oct 01:29:29 UTC) as of this moment (22 Oct 12:10 UTC). 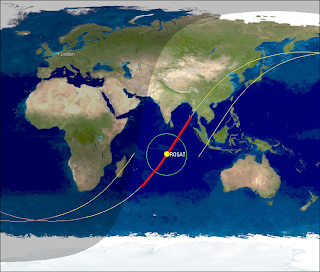 Shortly after UARS, another satellite about to reenter is in the news: ROSAT. I last observed and photographed it about a week ago (see here and here) - since then, passes have become unfavourable for the Netherlands. In an interesting twist, Sky & Telescope's J. Kelly Beatty reports that DLR and ESA sources confirmed to him that they expect the entire telescope mirror array - which weights 1.6 tons! - to survive reentry, impacting intact! Since Ted uses the same software I used for my UARS predictions, and hence our results will be similar, I will not put forward my own predictions here but refer to Ted's. These pieces of Russian space debris pop up more often on my images lately. They are the jettisonable torroidal (doughnut-shaped) fuel tanks of a Breeze-M, the upper stage of a Proton M. There are now over 40 of these spent empty tanks in space, often in highly elliptic orbits representative of a geostationary transfer. 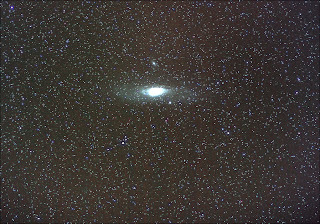 Just a few days later, on October 2nd, I took advantage of clear skies to image M31, the Andromeda galaxy. 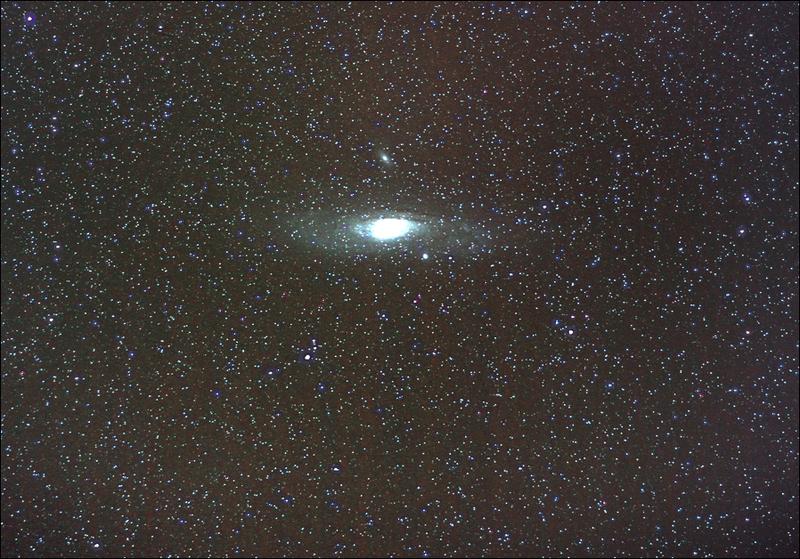 The camera (Canon EOS 450D) with the Samyang 1.4/85mm lens was piggybacked on a Meade ETX-70 in order to use the telescope drive to follow the stars. A long series of 10 second images was taken. Given that this image was taken from a town center with modest equipment, I am quite happy with it! 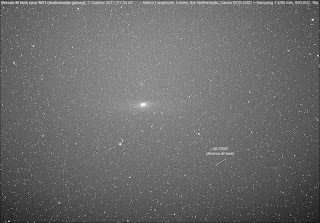 If you compare it to a single frame image (above) it shows the strong improvement in signal-to-noise ratio that comes from stacking images.The two satellite galaxies come out much better, and so does a glimpse of the spiral structure and dust bands in the Andromeda galaxy. A rather weird story has been posted here on the Technology Review website, based on this paper posted on Arxiv.org. In it, Manterola et al. discuss an observation from 1883 by Jose A. y Bonilla from the Astronomical Observatory of Zacatecas, Mexico. On August 12th and 13th, he observed objects passing in front of the sun during telescopic solar observations. These objects were "misty" (= unsharp?) and crossed the sun in about 1 to 1/3 seconds of time. They were not seen during simultanious observations from other Mexican observatories. The observations were published in L'Astronomy in 1886, and the editors put it down to dust in the telescope system, birds or insects crossing the FOV. Manterola et al. now make an argument that it were cometary fragments passing as close as 800 to 6000 kilometers (!) from earth, suggesting Earth narrowly escaped a shower of cometary fragment impacts. They also argue that it were fragments of comet 12P/Pons-Brooks. The latter theory can be quickly falsified (and so can be the suggestion that it were comet fragments passing close by earth). The 1883 nodes of the orbit of comet 12P/Pons-Brooks were at solar longitude 255.8 deg (ascending node) and 75.9 deg (descending node), corresponding to December 6 and June 5. The latter (descending node) is far away from earth, beyond Saturn's orbit. 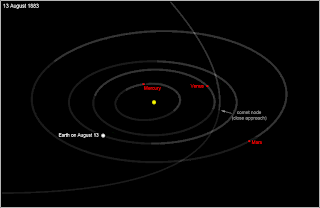 The ascending node is closer, but still closer to the orbit of Venus than to the orbit of Earth. This means that the earth only comes (not particularly) close to the cometary orbit near this date, and hence any fragments in similar orbits can only come close to earth on this date: December 6. Not on August 12-13, the date of Bonilla's observations. It should also be noted that the MOID between the Earth orbit and the comet's orbit is not particularly close (minimum 0.2 AU). Hence, it does not tally. These cannot realistically have been 12P/Pons-Brooks fragments. The whole story seems far-fetched and very unlikely. The "fuzzy" character of what Bonilla describes to me suggest out-of-focus objects, i.e. close by (with the telecope focussed on the sun), well within the Earth atmosphere and most likely within the telescope system. The "dark before sun disc, bright outside disc" is very odd, especially the latter - objects need to be very bright to outshine the sun and (presumably) a solar filter so close by the sun. 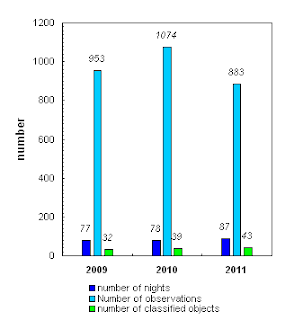 Moreover, the non-observation by other observatories (e.g. Mexico City) conducting solar observation that same day, is deadly to the hypothesis. Manterola et al. try to explain this by parallax, arguing that this must mean the fragments crossed very close to earth. However, the total observation time of the objects was 3h25m. Earth moves about 6150 km 370 000 km (about one Earth radius one earth-lunar distance) in it's orbit during that time, and the earth's surface rotates a considerable distance in this timespan too. This is deadly for the "restricted visibility area through parallax" argument. The area of visibility should be thousands of km wide, otherwise Zacatecas could not have had visibility for over 3 hours. The objects therefore really should have been seen from other places as well. 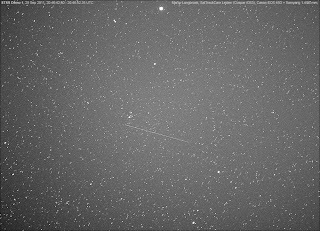 16 Draconid meteors photographed between 19:27 and 21:18 UTC, 8 October 2011. Canon EOS 450D + EF 2.0/35mm, 800 ISO, Dunkelsdorf, Germany. Photo by author. 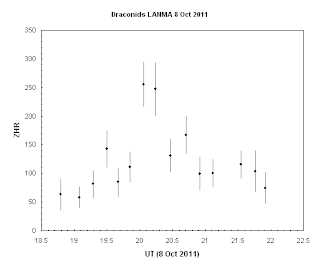 In the evening of October 8-9 2011, the Draconid meteor shower performed a rare meteor outburst. In normal years, hardly any Draconid meteors can be seen. But in 1933, 1946, 1952, 1985 and 1998, short but (very, in the cases of 1933 and 1946) intense outburst were observed. The earth crossed through dust trails left by the parent comet 21P Giacobini-Zinner those years. Zenith Hourly Rates were in the several hundreds in 1985 and 1998, in the thousands in 1933 and 1946. 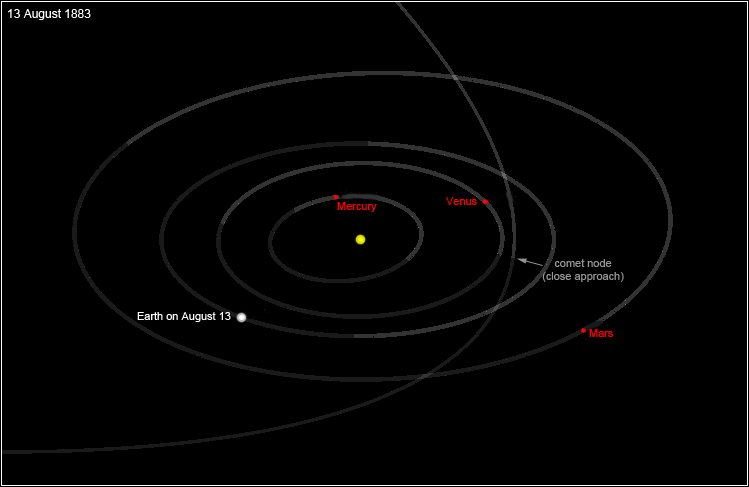 Last October 8th (2011), the earth was predicted to encounter a dust trail left by the comet in 1900. Predictions for the activity varied, from virtually nil to several hundreds/hour, depending on the modeller and model (see summary in sidebar here). Several scientific efforts were set up to monitor the event. I joined one of them, a joint effort lead by Peter Jenniskens (SETI/NASA-Ames) in cooperation with the Leibniz-Institut für Atmosphärenphysik (IAP) in Kühlungsborn, Germany (Michael Gerding), and Carl Johannink and me from the Dutch Meteor Society (DMS). 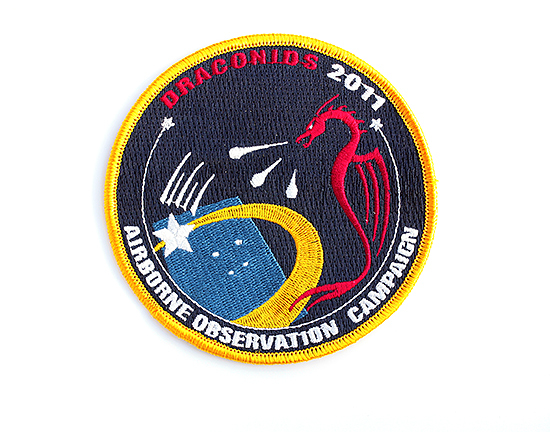 Our project was a groundbased part of a wider effort including two aircraft flying with scientific equipment (the Draconid 2011 Multi-Instrument Aircraft Campaign, see here). 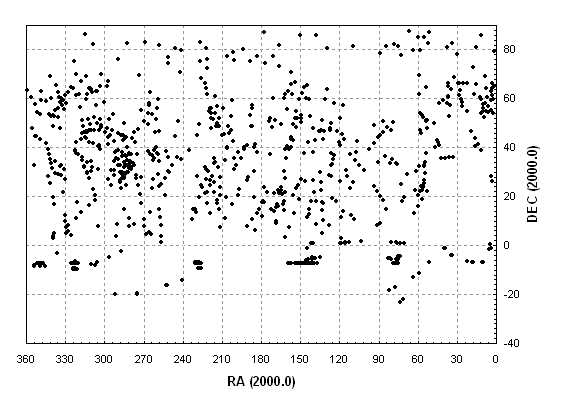 Our goal was to do observations that could not be easily done from the aircraft: determine 3D trajectories of meteors in the atmosphere by triangulation of images taken from two locations, in combination with an attempt to detect debris/ionization trails of these same meteors using a LiDAR. The LiDAR in question, was the LiDAR of the Leibniz-Institut für Atmosphärenphysik (IAP) in Kühlungsborn, a small bathing resort at the Baltic coast of eastern Germany. This part of the observations was done by Dr Michael Gerding of the IAP, who was also our host during the effort. 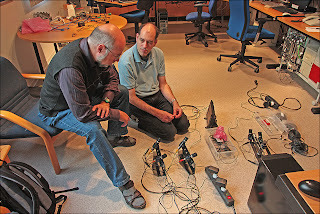 Peter Jenniskens, Carl Johannink and me would employ and operate the multistation video network, using the CAMS system build by Peter and his team at SETI/NASA-Ames (the CAMS project is part of NASA's Planetary Astronomy program). 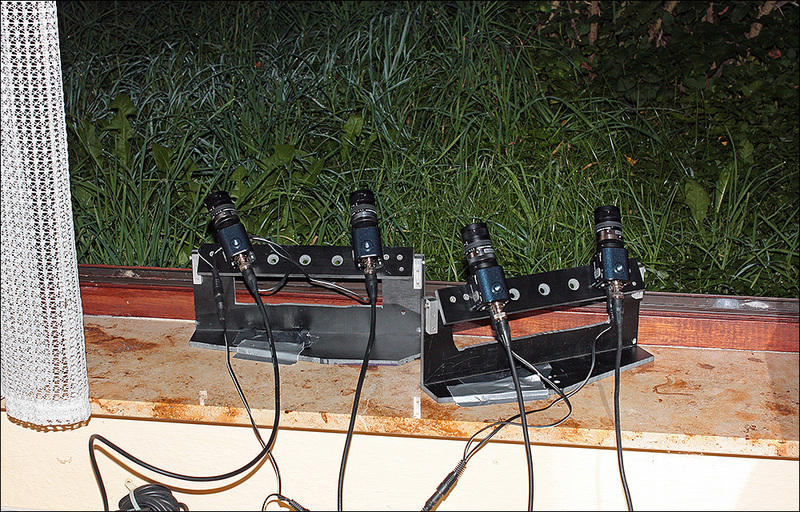 The CAMS systems (4 low-light level video cameras per station) used. Top: the setup at Lebatz station operated by Carl Johannink and the author (DMS). 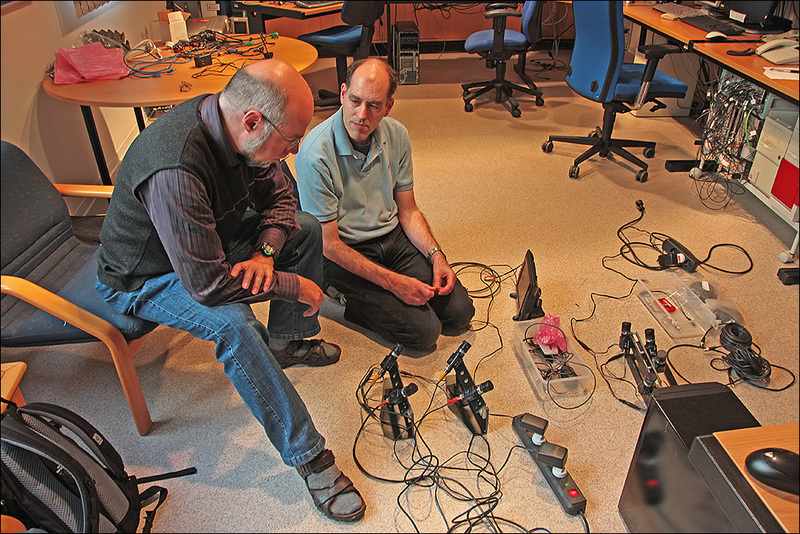 Bottom: the setup at the IAP Kühlungsborn station operated by Peter Jenniskens (left; SETI/NASA-Ames) and Michael Gerding (right, IAP). I fetched Peter Jenniskens from Schiphol airport near Amsterdam on Wednesday the 5th. We hauled his equipment (two heavy metal cases, apart from Peter and mine personal luggage) into the train to Enschede in the eastern Netherlands, where Carl fetched us and drove us the few remaining kilometers to Gronau, just over the Dutch-German border. This was our first base-station. The weather prospects were still very uncertain at that time. Peter wanted to press on with the plan to go to Kühlungsborn (because of the LiDAR). Carl and I were less certain: southern Europe had the best papers in terms of clear sky prospects at that moment. Weather predictions now suggested Northern Germany (where Kühlungsborn is situated) could benefit from a zone of clear air created over Denmark and Sleswig-Holstein in northern Germany in the "shadow" of the Norwegian mountains. It was settled that we would try Kühlungsborn. The early part of the day was spent running various errands. More seriously, one of the PC systems operating CAMS had a malfunction and Peter was not able to solve it. We left in the afternoon, driving several hundreds of kilometers to Kühlungsborn, where Michael Gerding of the IAP welcomed us near 22h local time after a long exhausting drive. 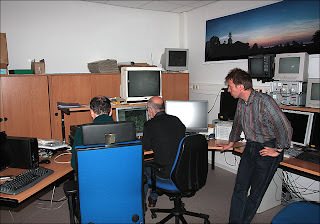 This day, we set up shop in the LiDAR control room of the IAP, which was to become our headquarters for the campaign. An IT specialist of the IAP was brought in to solve the PC trouble - eventually, he managed to find what was wrong and got everything operating again! Meanwhile, we had gotten a sightseeing tour of the IAP facilities. It is a beautiful, modern institute and the guest lodging in town where Michael put us up for the night was very fine. Kühlungsborn itself is a small cozy town, a bathing resort on the Baltic coast in the former Eastern Germany. Peter held a lecture before the institute members, Carl and I made a small beachwalk that afternoon. That evening was a test evening for the LiDAR, to see whether anything needed trouble-shooting. There actually was a problem initially with the LiDAR, but it was solved and didn't hamper the actual observations the next night. 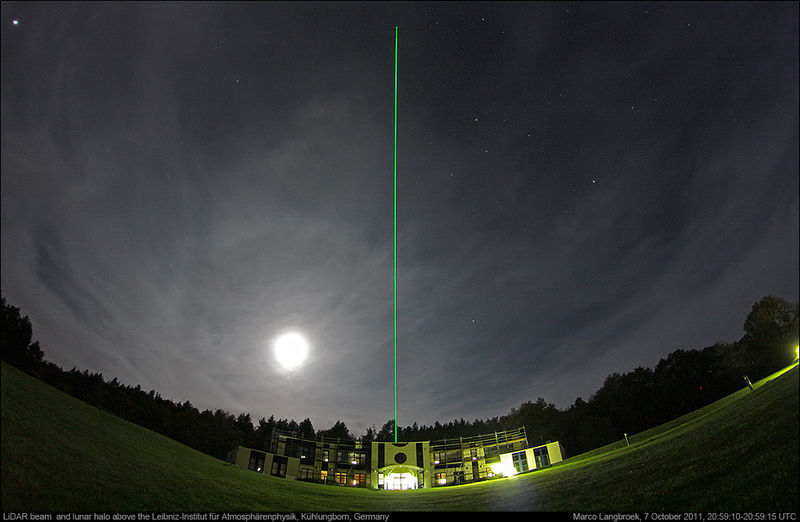 the IAP Kühlungsborn LiDAR at work during a test run a day before the actual observing night. Second image shows the beam hitting a low cloud. Photograph by author using an 8mm semi-fisheye. Seeing the massive laser beam of the LiDAR shooting up into the sky was quite impressive. Meanwhile, the weather was still very dynamic, so we worried about the next night, when all had to happen. Based on the latets weather forecasts, we picked a location 91 km to the west for our second site, right in the middle of the projected clear area in the weather forecast. Carl and I would run it, and so we drove away at noon, to the small village of Lebatz (53 deg 58' N, 10 deg 35' E) in Sleswig Holstein, about 30 km north of Lübeck. We had picked a small hotel from the internet there. The hotel owner was a bit surprised by our demand for a room "with a view to the north east". We needed the latter, as the mutual aiming point we had calculated for the Kühlungsborn and Lebatz CAMS systems meant we had to point at 46 degrees elevation to the northeast. 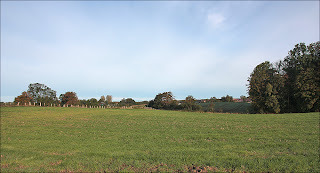 Peter at Kühlungsborn filmed 15 degrees north of the Zenith, just north of the LiDAR beams. 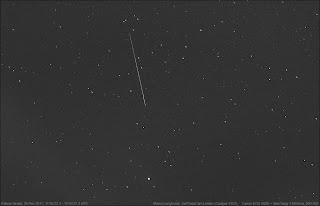 In that way, we would film the same meteors from both stations, appearing at 95 km altitude over the Baltic sea just north of Kühlungsborn: meteors whose ionization trails next would drift into the LiDAR beams, as a result of a high altitude wind blowing from the north-northeast at 95 km altitude. Meanwhile, two other Dutch observers, Peter van Leuteren and Sietse Dijkstra, had joined us: they had driven to Lebatz from the eastern Netherlands that same day, arriving about an hour after us. 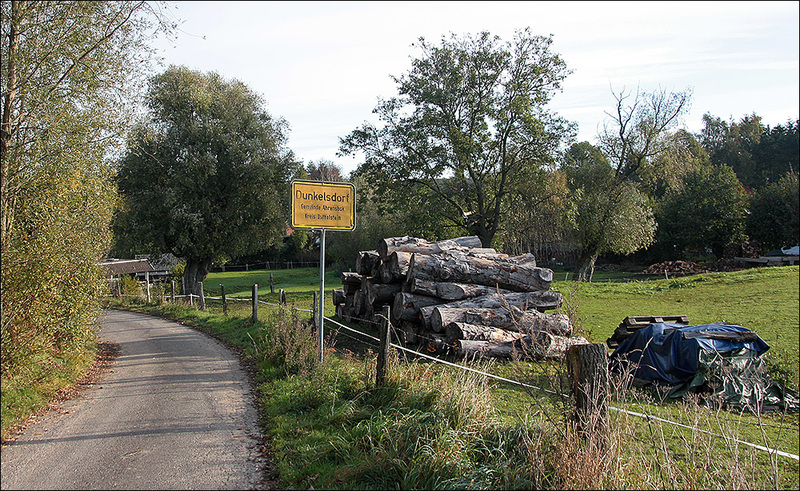 Just before our car turned into Lebatz (which, by the way, turned out to be one of the rare spots in NW Europe without cellphone coverage), I had noted a small roadsign saying: 'Dunkelsdorf, 1 km'. 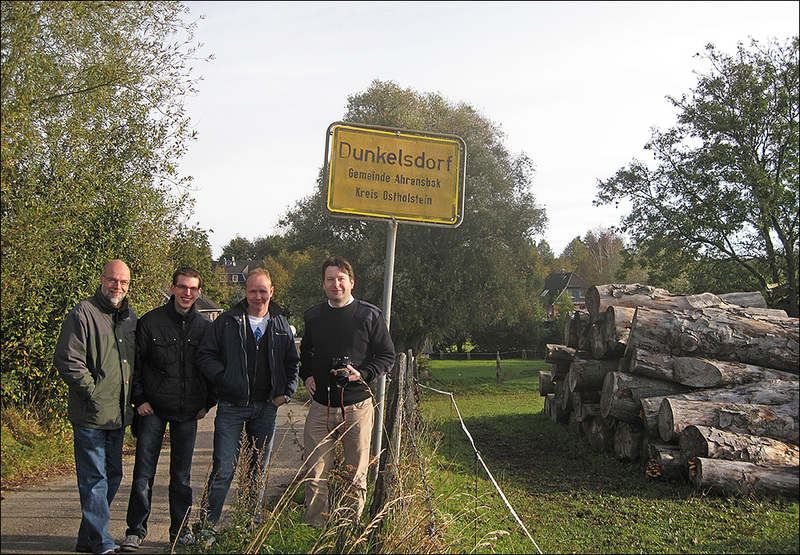 'Dunkelsdorf' means "dark village" in German. So naturally, that name appealed to us! After setting up shop in the hotel in Lebatz (our CAMS system would run from the open hotel window, as we needed electric power and a dry place for the PC), we drove the 2 km to Dunkelsdorf, and found a nice hiltop with 360 degrees view. The farmer was working nearby, and gave us permission to use the field that night (he turned out to be an astronomy enthusiast himself). After a good meal in the small tavern at the hotel, Peter v. L. and Sietse left for the observing field at dusk. The sky was clearing at that moment, witha few remnant fields of clouds. This looked very promising for the night! Carl and I stayed at the hotel waiting for the sky to become dark enough to aim and focus the cameras. That took some effort, also because we were not used to this new equipment. 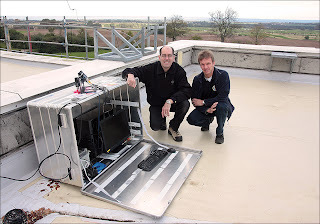 But with some trial and error, we managed to get the whole system running: and after the cameras are aimed, and focussed well, the PC takes over and the whole system runs automatically, and we could leave for the field. Neat! So after setting up, aiming, focussing and initiating the camera systems, Carl and I drove to the observing field as well, arriving there at 20:30 local time. Sietze and Peter v. L. already had seen some bright Draconids, they reported as we arrived. We set up our gear (field bed, sleeping bag, handheld memorecorders, and in my case a tripod with my photo camera) and joined the observations. The last cumulus clouds were moving out of the sky and it became brilliantly clear. Observing due North away from the moon, I determined a limiting magnitude of +6.3 in Draco to my (and my fellow observer's) astonishment, with the milky way visible into Perseus. This was wonderful, I have never experienced such a good sky with moonlight before! 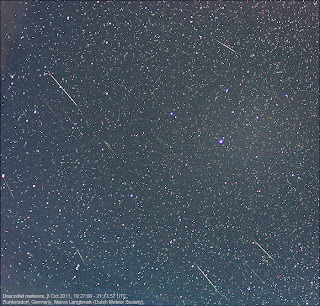 Directly in the minutes after I started observing, the first Draconids were seen. So there was activity, at least! Would it lead to a peak near 20h UTC (22h local time)? It did indeed lead up to a peak just after 22h local time. More and more meteors appeared, shooting away from a radiant in the head of Draco. 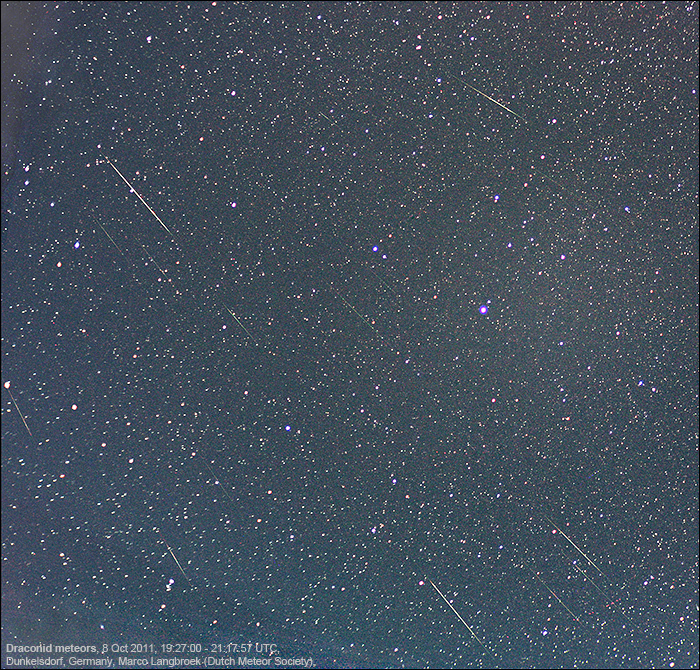 Around 20 UTC, I counted 3-4 Draconid meteors per minute. Most were rather faint, so we wondered what we would have seen without the moon.... Nevertheless, even in a moonlit sky, the show was impressive, and it was clear the Zenith Hourly Rates must be in the hundreds. We were excited! We were also worried. Low in the east, below 5 degrees elevation, we could see persistent clouds. That was where our other station was, Kühlungsborn with Peter, Michael and the LiDAR..... Telephonic contact (our cell phone did have coverage from the hilltop) revealed that they had a lot of clouds, but also clear periods. My observations suggest that the ZHR at the peak was in the order of 250. This is just an indication, as it are observations with moonlight, from one observer. 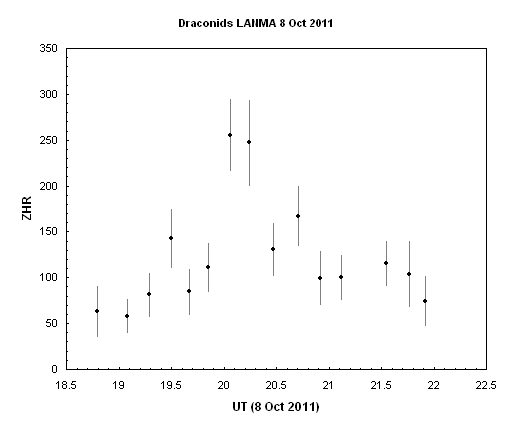 In total, I observed 248 Draconid meteors in 2.77h effective observing time. My photo camera with EF 2.0/35mm lens captured 16 Draconids (image above) in slightly less than two hours time: most meteors were simply too faint to be photographed. Our video camera's meanwhile, sensitive to much fainter meteors, filmed hundreds of meteors. The short movie shows the trail drifting from bottom right to upper left in about 2 minutes time: indeed consistent with a high altitude wind direction from the NE to SW.
After 22h local time (20h UT), activity was on the decline again. The peak was over. Around midnight, we stopped our observations (the CAMS system would run untill 1 am). It was still brilliantly clear: we couldn't have been in a better spot! The next day, Peter van Leuteren and Sietse drove back to the Netherlands, and Carl and I drove back to Kühlungsborn. Ariving there near 11 am, we heard the story of Peter and Michael. They had a lot of clouds, but luckily also a largely clear period of about an hour around the peak time. 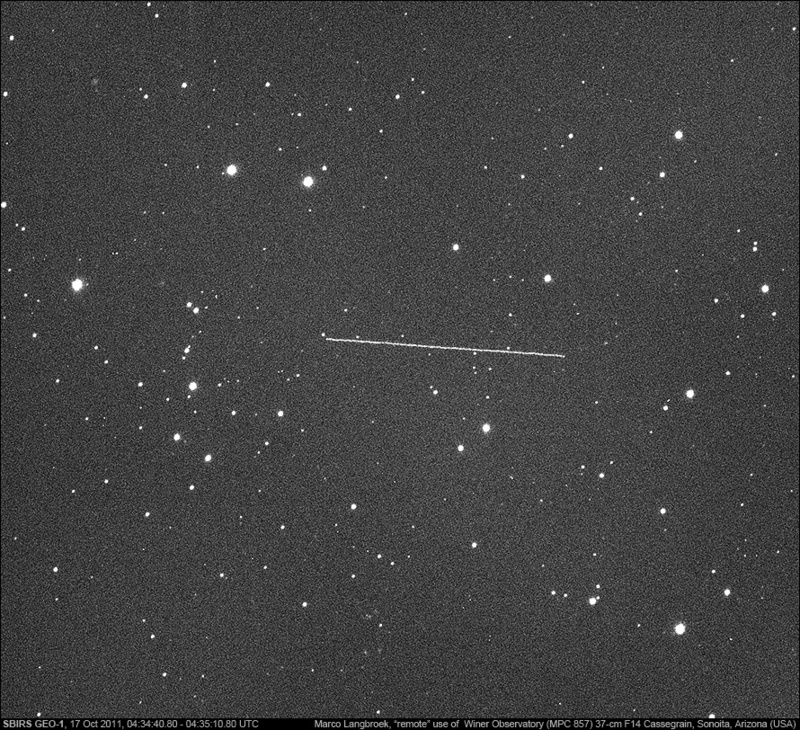 This increased our hopes to have filmed at least a few meteors multistation, hopefully with a LiDAR detection as well. With the data reduced we can now say we filmed at least 34 Draconids plus two sporadic meteors from both stations, yielding accurate atmospheric trajectories, lightcurves, and orbits in the solar system. 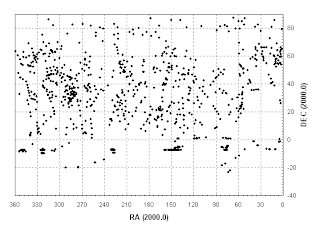 The LiDAR did have detections as well, but work to correlate these with meteors filmed by us is still in progress. If we do have LiDAR detections that we can correlate with meteors we filmed (more precisely: with the atmospheric trajectories and lightcurves that our multistation filming produced), that will yield a lot of information about processes happening in the upper atmosphere because of these meteors. Below is a compilation of video meteors filmed by three of the Lebatz cameras and one of the Kühlungsborn cameras. 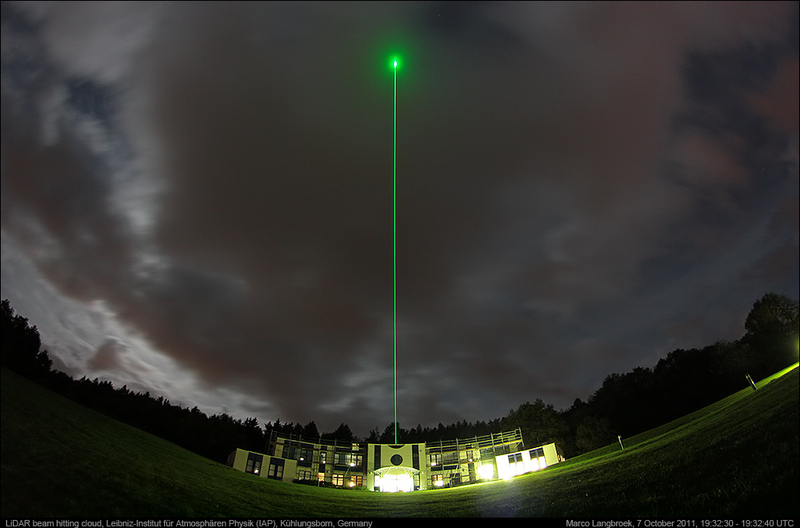 The latter images also shows the LiDAR beams (and clouds, unfortunately). Draconid meteors are moving from top to bottom, everything from another direction is an aircraft, satellite, or sporadic meteor. It was ten years ago that I last had been involved in such a scientific meteor observing effort - I participated in several of the Leonid meteor outburst scientific campaigns in the 1990-ies. It was exciting to get involved again for the Draconids. note: I want to warmly thank the people of the IAP and especially Dr Michael Gerding for housing us during the campaign. Yesterday evening was clear, and I again observed the doomed satellite ROSAT (see my previous post), in deep twilight (sun at -6 degrees). It was again bright, magnitude +1, very fast, easy to see even though the sky was still bright blue with only a few stars visible. Like my earlier observation the day before yesterday, it was steady in brightness, with no sign of brightness variations, suggesting it is not tumbling. These high elevation (near 70 degrees) twilight passes are quickly moving earlier (and too early) in the evening for me: yesterday's was the last one I could expect to realistically observe. Passes at lower elevation (12-14 degrees) in late twilight will become visible for me after tomorrow and might allow me to observe it for a few more days later this week, until these passes move too early as well. Using Alan Pickup's SatEvo software and the current 10.7cm solar flux, I get a projected decay at October 23. Harro Zimmer, using another model, gets October 24th. These predictions still have an uncertainty of a few days, so expect them to shift over the coming days, amongst others due to changing solar activity. Shortly after the UARS reentry, which got wide attention, another scientific satellite is about to meet its demise by an uncontrolled plunge into the atmosphere. It is the German X-ray astronomical satellite ROSAT. This satellite is currently predicted to reenter about October 22 to 24. This evening I watched it pass during twilight (sun at 8 degrees below the horizon, first stars just visible in a blue sky). 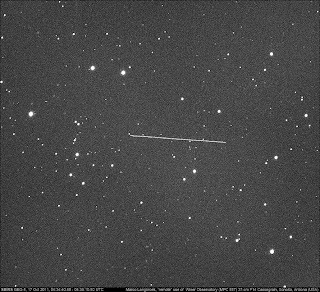 It was fast, zipping across the sky, and bright: magnitude +1 and an easy naked eye object. I used the new EF 2.0/35mm lens (a new purchase, first used last weekend during the Draconid meteor outburst, on which I will post in a later post), set to F2.5, making 5 second exposures at 400 ISO. The fast moving objects ran out of the frame of two of the three images. Below is the image thats shows the complete trail. The satellite was moving from left to right, across Cepheus. The streak in top is a streak of cirrus. 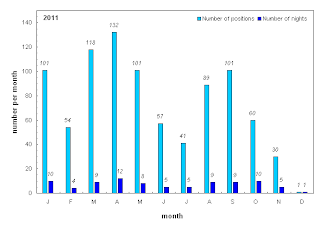 The focus on the UARS decay the past two weeks will not have escaped the frequent readers of this blog. It is now time to leave UARS to rest, and turn back to business as usual . The past week saw warm and sunny weather. I managed to observe on 27, 28 and 29 September as well as October 1st. The KH-12 keyhole USA 129 (96-072A) was one of the major targets. Both on the 28th and 29th it flared to mag. +0.5, at 20:17:04.8 (28 Sep) resp. 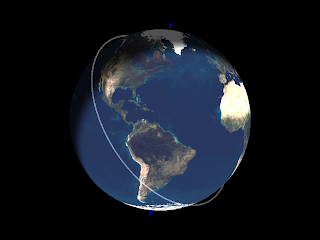 20:21:04.0 (29 sep) UTC. These pieces of Russian space debris pop up more often on my images lately. They are the jettisonable torroidal (doughnut-shaped) fuel tanks of a Breeze-M, the upper stage of a Proton M. There are now over 40 of these spent empty tanks in space, often in highly elliptic orbits representative of a geostationary transfer. Even at considerable distance, they are bright. During perigee passes, they zip through the sky at high speed as bright naked-eye objects. Further out, they move slow but are still relatively bright, as visible on the image above. The Breeze-M tank above was at a range of over 2700 km (by contrast, USA 129 was at a range of 948 km) at the time of photography, and is a leftover from the 2004 launch of the South American geostationary communication satellite AMAZONAS. On that same night of September 29th, I used the Samyang 1.4/85mm to target, two of the Space Tracking and Surveillance System (STSS) satellites, STSS Demo 1 and Demo 2. (09-052A & B). 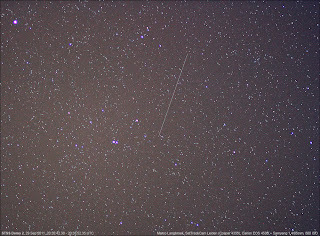 Both these faint satellites were captured near their apogee at approximately 1359 km altitude. 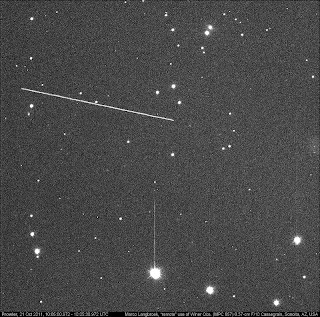 Other satellites photographed these nights were the Trumpet ELINT and SBIRS low satellites USA 184 (06-027A) and USA 200 (08-010A), two satellites in HEO. In addition, I used the 61 cm telescope of SSON in California to photograph the enigmatic Prowler again (see also my previous post here for backgrounds on this highly classified satellite).